When we travel to New Orleans we always stop in Arnaud’s French 75 Bar for a classic French 75 cocktail, a refreshing combination of Cognac and Champagne with a dash of sweetness and a splash of lemon juice. 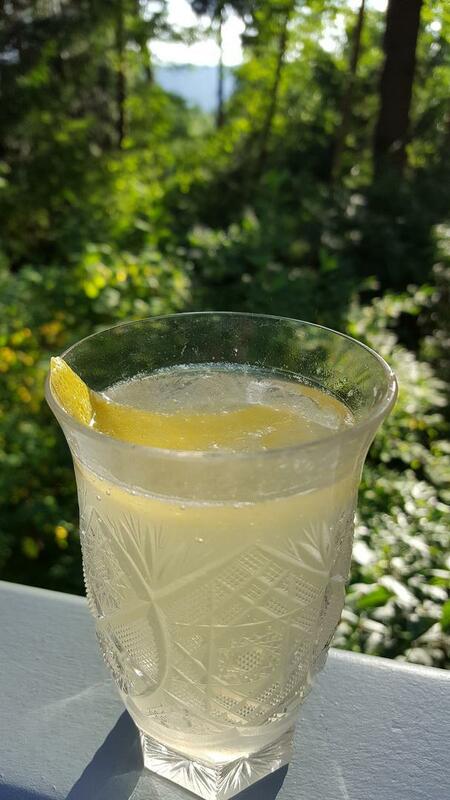 It’s a drink that cuts the heat and humidity and leaves you refreshed and feeling downright civilized. Arnaud’s is a classic New Orlean’s restaurant that has featured traditional Creole cuisine since 1918, and their vintage bar next-door is where you can enjoy a number of well-made classic cocktails such as the French 75, Sazerac, and Bastille Cup. Though not quite as hot here in Seattle as NoLa, we're feeling nostalgic for the “Big Easy” and have been making what’s now our favorite summer Champagne cocktail. And we’ve gotten quite a few others hooked on this delicious libation as well! We use a nice herbal gin in our version, but if you want to keep it authentic to Arnaud’s then use Courvoisier VS Cognac in lieu of gin. You can’t go wrong either way. Cheers! To make the simple syrup, heat 1 cup sugar in 1 cup warm water in a saucepan over medium heat until the sugar has dissolved. Cool to room temperature before using and refrigerate the rest. Fill a cocktail shaker with ice. Add gin or Courvoisier VS Cognac, lemon juice, and simple syrup. Shake well and strain into a Champagne flute or cocktail coupe. Top with Champagne and garnish with a lemon twist.